England coach Andy Flower says he is worried that not using the Decision Review System (DRS) could cause trouble in the Test series against India. Flower said it was an "unsatisfactory" situation, particularly after two controversial lbw decisions in the first Test. He believes umpires would be happier if they had the system available. "We all know that it is not 100% accurate but we also know you get more right decisions using it," he said. Flower spoke after umpire Billy Bowden turned down lbw appeals against Sachin Tendulkar and Suresh Raina in the first Test at Lord's. Replays indicated the decisions were incorrect and Flower said the incidents drew attention to the lack of DRS. Both sides have to agree to its use and the Board of Control for Cricket in India, which has been a vocal critic of the technology, objected to it. Despite the controversy over the lbw appeals, neither decision affected the result with Flower's side securing a 196-run victory. But Flower predicts the issue could cause controversy in the remaining three matches of the series, with the second Test at Trent Bridge starting on Friday. Asked if he was worried there could be trouble ahead, he added: "Yes, I am actually. We almost saw it happen in this Test match. "It would have been wrong if the outcome of the game had been seriously affected by a couple of those decisions and it was quite right that, luckily, we did continue to create chances. "It's unsatisfactory the way it is. There is no doubt about that." International Cricket Council chief executive Haroon Lorgat has pledged to commission independent research into ball-tracking in a bid to persuade any doubters. 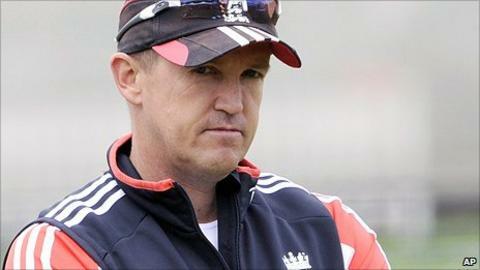 But Flower believes the ICC should have acted more decisively on the issue ahead of this high-profile contest. "I don't think there's anything we can do but I think the ICC should be stronger in taking a lead on these issues," said Flower. "They are the world governing body and they should lead. I don't think it's unfair to say they haven't led on this topic. "Let's not quibble about millimetres here when we know you get more right than wrong. That's why most Test-playing nations want to use it. "[Umpiring] is a very difficult job. We all know that and I think they would be happier with it too."